100% linen and 100% Able & Game's offbeat humour and distinctive illustration! 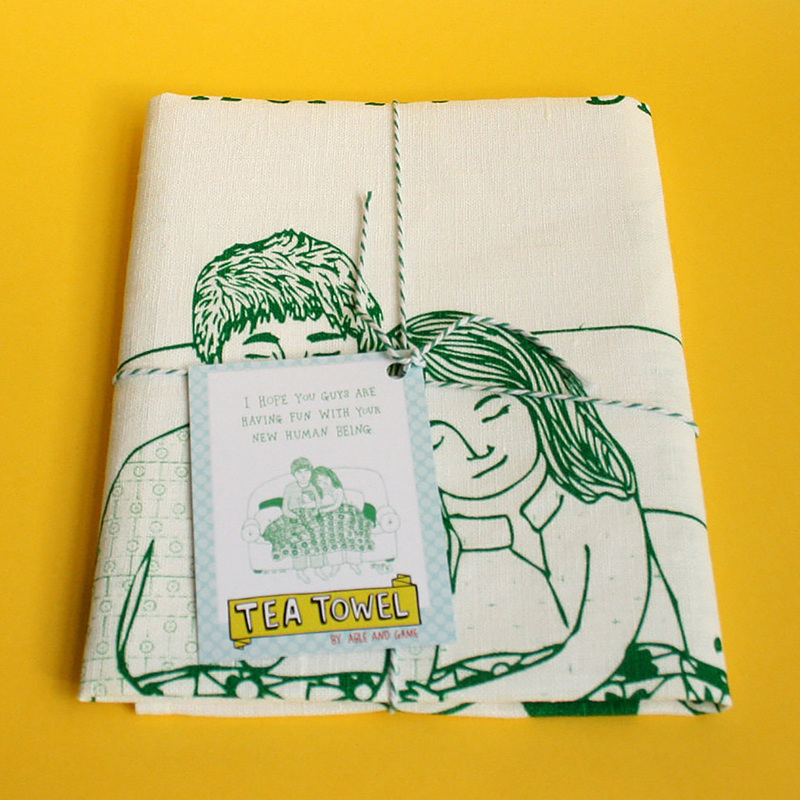 This tea towel features a drawing of a new mum and dad holding their brand new baby, screenprinted in green with the text "I hope you guys are having fun with your new human being". Able & Game's tea towels have been printed in Melbourne on 100% linen, they have a lovely texture to them and the screenprint suits the fabric perfectly. As with any hand screenprints there are little variations in the ink, but this is what makes the towel lovely and unique with no two prints are alike. You can use your tea towel to do the dishes, or if you want to fancy it up you could frame it, or stretch it. After a few washes and uses it starts to soften up, but the first time you wash it it will shrink a little and feel a bit denser. We recommend washing your tea towel in a cold cycle on your machine with other similar coloured items and pop on the line to dry. It will go a little wrinkly after the wash so just gently pull it back into shape before hanging up to dry. Iron on the reverse side of the print with a warm iron. Don’t tumble dry or dry clean. The tea towel will shrink a little when you wash them for the first time, but it shouldn’t affect the print.